My current setup for podcast recording. I started officially podcasting with The Jamie and David Show (completely NSFW) in 2009. We fell off the wagon for quite a while but have been doing shows about once a month for a while now. We’ve been through a few different methods of recording, but this is the current setup. I am not making any money from the show, so this is my budget version of podcasting. 2. Software. I have always used Audacity to edit and assemble my podcasts. It’s free and really user friendly. 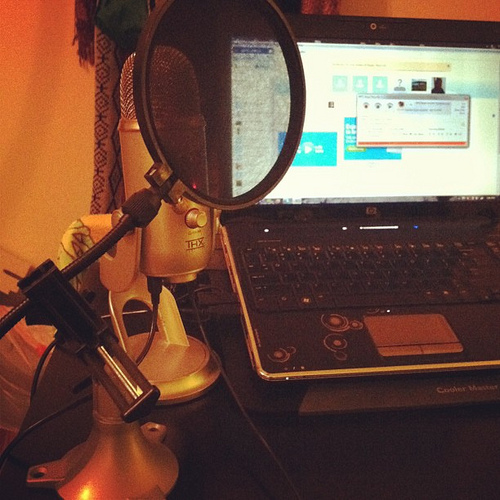 Here’s a list of some other pieces of software for podcasting. I also use MP3 Skype Recorder (also free), since David and I do not currently live in the same place so Skype is a necessity. It’s also been great for recording interviews for the show. 3. Hardware. Other than the computer, there are some things you need, at the very least a microphone and headphones. If your computer has an onboard mic, feel free to start with that. However, if you’re going to be using Skype or another program to record with more than one person, a set of headphones is necessary to avoid feedback issues. Even earbuds will be fine for this. After doing some reading about sound issues, I also purchased this Nady Pop Filter ($17.56 on Amazon), which has been an amazing improvement for the money. I cannot listen to our old episodes now without feeling like I’m being tortured. I’m thrilled with the results that have some from spending less than $100 to improve the sound. I don’t imagine I will ever need to replace these items. 1. Hosting Location. You need somewhere to host the file you’ve created, and a good place to start would be Blogger. You can get a free blog, and easily post files and have an RSS Feed created for you. Tumblr + Dropbox would also work, as described here by Adam Wilcox. 2. RSS Feed. Feedburner will let you enter in the RSS feed info and it will convert it to work as a podcast feed. In my opinion, everyone should be using Feedburner for their podcast feed, because the stats are good, and if you ever change hosting locations, you will not lose subscribers when you update the information. 3. iTunes Submission. 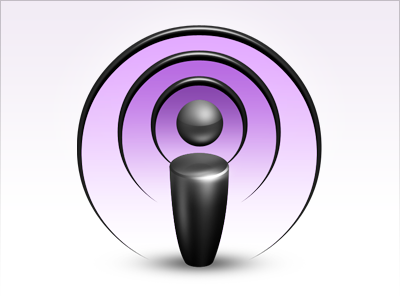 It is free to submit your podcast to iTunes, so why not? Here’s a great instructional page from the fine people at iTunes on creating and submitting your show. I started out our show at Mevio, but that went downhill and we lost all of our data and subscribers. I learned the hard way about not using Feedburner. After some Twitter chat, I moved our show hosting to Libsyn, and started hosting our show notes on a Tumblr blog. I chose Tumblr for this particular show because of the existing audience for our content and ease in sharing. Libsyn is not free. The cheapest plan is $5 a month for 50MB of file adding. I currently have the slightly higher $15 version as our shows are rarely under 50MB. Libsyn really did all of the work with creating our new show feed, and that was the clincher in choosing to move our show there. It’s super simple to add episodes and so I will stick with them for now. However, the free methods are totally fine as well. 1. Music. Some podcasts have music constantly playing in the background, which isn’t for everyone. Some, like mine, have music at the beginning and the end. You can certainly Google “royalty-free music” to try and find something to use, but I highly recommend Jamendo. Searching for what you want is very easy, and there are a lot of free options for downloadable tracks. Remember to give credit to the artist in your show notes! That’s my guide for podcasting on a budget. Please leave your own ideas and tips in the comments! Thanks for the link back to my blog and really interesting to see how you podcast.